All the literacy games you need to run a full station teaching English lesson. Ideal for literacy power hour or a team teaching initiative. Each game works with a group of children. Each game can be used as a full station. Created by an experienced Irish primary school teacher. Encourages collaborative and active learning. Each game / activity will work with a minimum of 4 players. Learn how to follow multi-step directions while learning positional words and rhymes. Children will use a spinner to tell them where to place picture cards—in a tree, on a hat, over a chair, near a box and more! Includes multiple instructional rhyming games and activities. Largest objects measure 3”H. As easy as 1,2,3, BrainBox ABC covers each letter of the alphabet as well as the more common letter blends. Showing letters in upper and lower case and images beginning with each letter, this is a great game for children learning the alphabet. Turn any 10 minutes into quality time. Builds basic skills from alphabet recognition to vocabulary and sensory motor skills. Learning the ABCs can be a treat with these freshly baked alphabet cookies! Spin the wheel to be the first to collect five cookie letters in a row, name other items that start with your cookie’s letter, or collect the correct cookie letter—with your eyes closed. Each Take10 game has multiple game-play options that all take under 10 minutes to complete. Introduce CVC words using these durable, double-sided CVC magnets. Each magnet depicts an outline on one side and a template on the reverse to support decoding and visual strategies for learning the spelling patterns of words. Alternatively you could use our Whiteboard markers. COmes with Magnetic Letter Pack. Contains 33 word magnets. Why not play two fabulous family favourites through using early years reading strategies? When playing Snap with this fantastic deck of cards, the aim is to snap letters with images of items that begin with that letter; for example the letter ‘A’ would snap with an image of an apple and an ant. To play Pairs, simply turn all the cards upside down and turn two over to see if they match. If they do, then they are kept; if not, you turn them back face down. The aim is to collect all the cards. Two fun games in one that help children learn fundamental reading strategies. 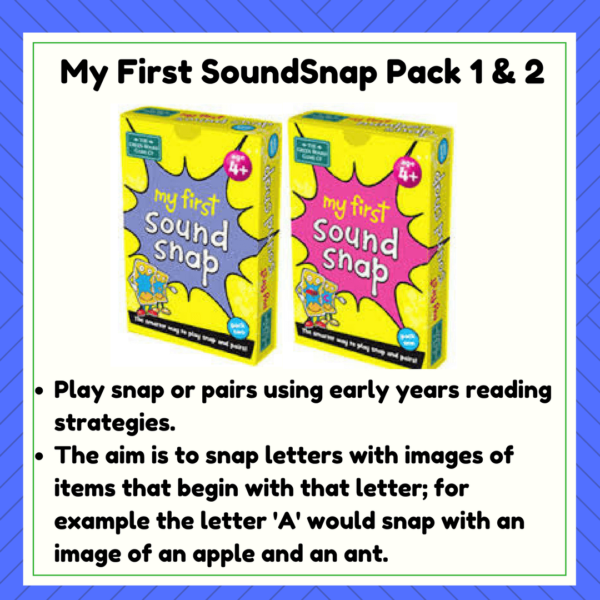 Helping children gain a head start at school in an essential skill, My First Sound Snap is the smarter way to play Snap and Pairs! 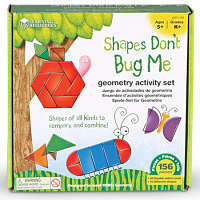 A creative way to introduce geometric shapes! A modern take on 'colouring in'! All the maths games you need to run a full station teaching maths lesson. Ideal for maths power hour or maths for fun initiative.